CONTACT US NOW TO BECOME INVOLVED! Please tell us a little about yourself or your company and any other message. As I am sure you know, on Thursday, January 4th, the Department of the Interior released a plan to open up our coasts to offshore drilling, including the Miami area. While it appears they rescinded that a few days later, we are still in very real danger of oil exploration and drilling happening right off our coasts (more info on this to be released very soon). This will be devastating to our tourist and international real estate based economy. To that end, we have joined with the Oceana Florida emergency response coalition of nearly twenty organizations to raise awareness. We are producing a family-friendly music and art festival to provide enlightenment and engagement opportunities for our residents. In addition to the coalition of organizations, we have a number of politicians and others interested in participating. We are moving forward quickly to put this all together. We are doing this on very short notice because there is only a small window of time for public comment on the plan. 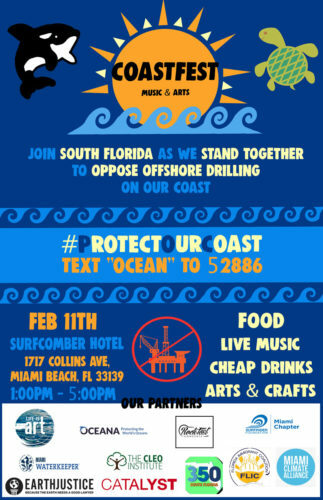 “CoastFest – #ProtectOurCoast Family Music & Art Festival” will be on Sunday, February 11th at the Surfcomber Hotel in Miami Beach. The event will include live music, art and arts activities, activations fnon-profit organizations, businesses, and vendors. It is free and open to the public. I know this is very short notice, but we ask for your support in helping us to spread the word and save our shores. We would like to engage with you to join us in this awareness-raising campaign and event. EVERYONE – come have fun while learning more, to share with your contacts, invite your friends, and stand with us against drilling on our coasts. * VISIT THE FACEBOOK EVENT PAGE.